Applications are invited for this fully funded (tuition fees plus additional stipend), full-time PhD EPSRC iCASE studentship, to start in September 2018 or as soon as appropriate. It is intended that this studentship is part of a newly established partnership between the University of Manchester and Arm Research. The emerging infrastructure of the Internet-of-Things (IoT) offers unprecedented opportunities to build systems which integrate networks of things, services, and people. The expansion of the borders of systems to capture data from ambient and personal sensors, communicative tools, mobile and ubiquitous computing devices, defines a dramatic increase of the sensing substrate which can be used as the basis for the construction of the next generation of computing systems. However, the heterogeneous and distributed nature of this substrate introduces new requirements for developing systems over the Internet-of-Things. Designing, programming or managing these new environments requires metaphors, interfaces, and interaction strategies for supporting programmers in the construction of IoT systems. Additionally, many IoT application scenarios require higher personalization and contextualization. Despite the sophistication and prevalence of user centered design methods, it is increasingly problematic for software developers to anticipate the needs of users at design time. In many situations, end-users themselves (either domain experts or consumers) should be enabled create and adapt systems to their preferences. This project aims at building an end-to-end software development environment for the Internet-of-Things to support end-users in programming tasks. A central goal to the project is to enable end-users to build IoT applications using the combination of natural language commands, semantic search and visualization. The proposed programming environment is built upon the concept of schema-agnostic data environments, where end-users are abstracted away from the underlying data representation and can program using their own vocabulary. 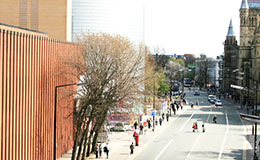 The University of Manchester boasts one of the most innovative and successful schools of computer science in the world. Manchester saw the birth of computer science, with the creation of the world's first stored-program computer. We continue to work on pioneering research with widespread activity and strength in a range of key aspects of computer science from hardware through to user interaction. The School of Computer Science was ranked in the top 5% in the UK (4th out of 89 submissions) based on GPA for Computer Science and Informatics in REF2014, the most recent UK research assessment. REF2014 also assessed that The University of Manchester is the best environment in the UK for computer science and informatics research, with 94% of our research being classed as "world-leading" (4*) or "internationally excellent" (3*). All our "impact" case studies were ranked 3* and 4*, which puts us joint-top for research impact. Arm is the worlds leading semiconductor intellectual property (IP) supplier. In 2015/16, Arm's customers shipped 15 billion processors - more than 2 processors for every human being on the planet. Arm Research looks beyond today's products to identify problems and opportunities to generate better experiences for people in the future. The student will be expected to engage with Arm/Arm research through regular meetings and, at times, through short periods of work at Arm premises. Applicants should have or expect to obtain a BSc 1st Class or MSc with Distinction in computer science or a related discipline and strong programming skills. Applicants must also have British citizenship or be a permanent resident and have lived in the UK for the last 3 years. Exceptional EU students may be eligible. Deadline for applications is Friday 6th April. Qualified applicants are strongly encouraged to informally contact Sarah Clinch (sarah.clinch@manchester.ac.uk) and/or Andre Freitas (andre.freitas@manchester.ac.uk) to discuss the application prior to applying. A degree (or equivalent experience) in Computer Science, Electronic Engineering, Maths, Physics, Data science or a similar relevant science or engineering or technical subject. Previous academic or industry experience in Natural Language Processing or Human-Computer Interaction.